Gobble up a well-balanced meal this Thanksgiving. MS specialists recommend a diet filled with fruit and rich in protein, fiber, and healthy fats. While there is no perfect “MS diet,” the National MS Society says that a nutritional diet can improve your energy level and overall health. Limit starch-heavy sides, such as stuffing, bread, and potatoes at your next Thanksgiving celebration. Instead, try turkey, fruits, and vegetables this holiday season. As always, be sure to talk to your healthcare provider before making any changes to your diet. The apples and Greek yogurt in this fruit tray are a healthy source of protein and fiber. This quick and easy recipe will only take you 15 minutes to prepare, so you’ll be able to spend more time with your family and friends and less time in the kitchen. Our healthy, yummy, and decorative fruit platter will surely be the center of your Thanksgiving celebration. Tell us below in the comments about how you incorporate healthy alternatives into your Thanksgiving meal. Use a mixer to beat the cream cheese into a smooth texture. Add the Greek yogurt, powdered sugar, and cocoa powder. Pour into a bowl and place the bowl on a plate. Add 2 chocolate chips and a piece of candy corn to the dip to make the turkey’s face. Cut the apples into slices. Consider purchasing presliced apples to make prep even simpler. 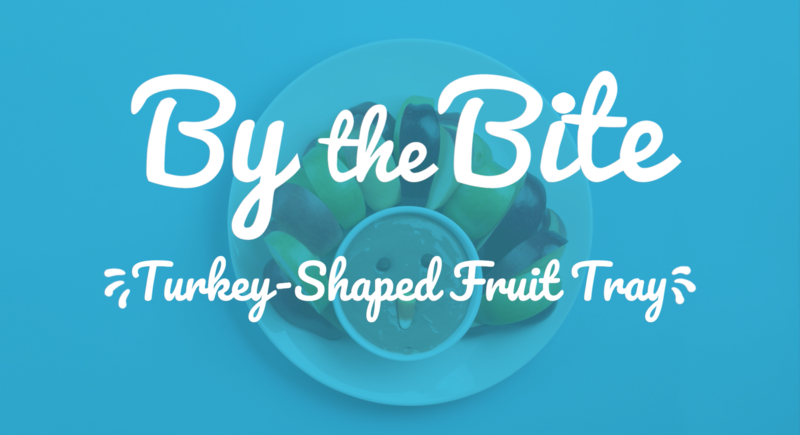 Arrange the apple slices on the plate around the dip to create the turkey’s feathers. Feel free to substitute the Greek yogurt dip with your favorite fruit dip. Get creative and make your own turkey tray with vegetables instead of fruit. Looking for more sides to bring to your next Thanksgiving feast? Check out our other holiday recipes to share with your family and friends. We would love to stay connected! Sign up to have more posts like By the Bite sent directly to your inbox. That's great to hear, Diane! We hope you'll enjoy reading more of the posts featured on the blog. Let us know what you think! If I want to make a day ahead, how do l keep the apples from turning dark? That's great to hear, Bette! You might also like this blog post: https://liftms.com/motivation/lunch-recipes. We wish you the best!